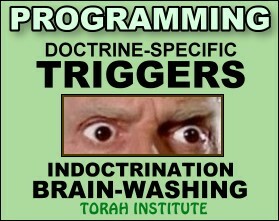 Are We Indoctrinated To Disobey, Or Obey? Is Paul to blame for being misunderstood by the lawless, or is it a test Yahusha intended? Paul was not a Roman Catholic, and neither was Luke or Kefa. They didn't play with holy water or have any relics. They didn't dispense “grace” with sacraments. They taught the message of the reign of Yahuah, and Yahuah's Commandments as Yahusha told them to do. This yoke was not the Torah of Mosheh; it was the traditions of the fathers. The yoke (teachings) of the traditions of the fathers was keeping men from calling on the Name of Yahuah, and giving praise to their own authority and decisions. There’s a growing number of people debating over Shaul, later called Paul, these days. Generally, there are three views of him. Kefa (Peter) told us that Paul’s letters were difficult to understand (2Kefa 3:15,16), and his words were twisted by the untaught and unstable, inclining them to lawlessness (anomia). View #1: For most of Christian history, Catholicism taught that deliverance comes by receiving grace (better rendered KASID, kindness) through sacraments, and that any obedience to the Commandments of Yahuah was seen as judaizing (meaning to live by the traditions of the fathers) and cut them off from Mashiak. The Reformers started on the path back to the Truth by rejecting any salvation based on human efforts, such as indulgences or the 7 sacraments, yet Luther still brought a few of the sacraments out with him. Paul’s writings have been used to defend the position that believers are saved by KASID (kindness aka grace) alone (Eph. 2:8,9), apart from repentance from sin. Sin is disobedience to Torah (1Yn. 3:4). 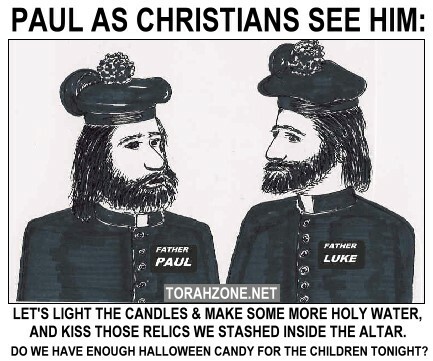 Paul's so-called anti-Torah (anti-law) comments have been used by Catholicism as well as the Reformers, because they desire to maintain the Replacement Theology of Romanism (that the church / circus replaced Yisharal), setting aside the Ten Commandments. The Ten Commandments that define sin have been annulled in this view, and salvation through belief in Yahusha’s shed blood supersedes any need to obey. They claim we are now free from the curse of the law, and anyone attempting to obey the Old Covenant is seen as a heretic, judaizer, and a reprobate. For centuries this view was enforced through the Catholic institution’s dogmas as well, and any competing views were vigorously eliminated - with extreme prejudice (killed). Marcion promoted the forbidding of what is called the "Old Covenant," which included the Torah, the Prophets, and the Writings. He allowed only the writings of what came to be known as the "New Testament." View #2: Today many go to the opposite extreme and call Paul a heretic responsible for the apostasy, the falling-away from the Torah by Christianity. For those who believe Paul’s letters seem to promote an annulling of any Commandments pertaining to the definition of sin, or contradicted the words of Yahusha, consider that you may have misunderstood what Paul was referring to. We don’t live under the penalty of Torah (death), and our crimes are nailed to the tree, not Torah. View #3: We who accept Paul but reject lawlessness have been given a balanced understanding of his letters. Paul was the apostle to the gentiles, who were known as adult males uncircumcised in their flesh. Paul’s letter to the Galatians (and other texts) addressed the rule of adult male circumcision, which had been up to that time a cornerstone for any Gentile converting to the faith of Abraham, Yitshaq, and YaAqob. Immersion became the outward sign for converts. Further study will reveal this; Kefa pointed out that Paul's letters were not easy to understand, but were twisted by those who were untaught (2 Kefa 3:15,16). Kefa warned us to watch, lest we be led away to destruction by the delusion of the lawless. He didn’t include Paul as a lawless one, but stated that Paul’s letters were being twisted, as were “the other Writings.” Kefa explained there was a misunderstanding in those who thought Paul said there was an “end” of the law. His warning is for those who believe they are free to disregard the Commandments. Kefa mentioned their destruction, so this is critical to get corrected, and why I’m explaining it. For those who believe Paul was a heretic that needs to be exposed for what he wrote about bringing an “end of the law,” you have also misunderstood his writings. Kefa called Paul “our beloved brother” at 2Kefa 3:15. Is Kefa a heretic also? Luke, who wrote about 40% of the Natsarim Writings, was the most orderly writer of them all. He started at the beginning, writing both Luke and Acts to a person named Theophilos. He began his first narrative with the birth of Yahukanon (aka John), Yahusha’s cousin. He tells us how Yahukanon immersed Yahusha. Yahukanon was finally imprisoned and beheaded by Herod. In chapter 3, Luke details the lineage of Yahusha, and goes on to describe all the miracles and teachings of Yahusha. Luke also wrote the Acts of the apostles; and of no small mention is Paul, the man Yahusha personally converted. Paul is described as the apostle to the gentiles, and Luke traveled with him to many cities witnessing in the synagogues (congregations). Luke recorded Paul's (formerly Shaul) conversion by Yahusha, and Yahusha didn't seem to think Paul was a heretic, but rather Yahusha told HananYah of Paul: "Go, for he is a chosen vessel of Mine to bear My Name before nations, sovereigns, and the children of Yisharal." - Acts 9:15 Even HananYah stood corrected, since at first he thought Paul was the most dangerous man on Earth to Natsarim. Paul was also at the Yerushalayim Council, Acts 15. If you regard Paul to be a heretic, then you will also have to trash Kefa and Luke. The only way to overcome the misunderstanding of Paul’s letters is by seeing that he was under constant criticism (in his time) over the topic of adult male circumcision for converts. Acts 15 addressed this controversial matter, and it should have put it to rest forever; but we know that even today there are those who wrestle with it, causing division in the body of Yahusha. When Paul seems to be saying we are no longer “under the Torah” the Torah he is sometimes referring to concerns adult male circumcision. Other times Paul is speaking of the old priesthood, and the animal blood which could never permanently justify for sin. The Ten Commandments are never being called "weak and miserable," this was Paul's opinion of the Galatians falling back into their old pagan habits. Ephesians 2:8,9 discusses "works" not saving us; but Paul refers to those ceremonial works which we had formerly relied on such as animal sacrifices, circumcision, etc. The word "them" refers to the good works prepared beforehand, the Ten Words, called the eternal Covenant, the Ten Commandments. Works are the fruit of our faith, and perfect or complete our belief. If we believe, but don't obey the Commandments, Yahusha will not be able to say "Well done" - but He will only be able to say "Well believed." Although human effort doesn't save us, when we are saved a great deal of human effort gets in line with the correct way of living. It is difficult for the elect (Mt. 7:14, 1Pet. 4:18), but when you LOVE what you do because He has given you the desire in your heart, it is not a grievous burden to obey the Commandments; it's an act of love. Ephesians 2:11,12 - verses to continue with awesome information. These reveal that gentiles are no longer gentiles when they are converted and immersed, but they become fellow citizens of Yisharal (there's only ONE body with no division). So, please understand that the uncircumcision (in the flesh) are indeed circumcised, being the workmanship of Yahusha - circumcised by Him in their hearts with a love for Torah. Read Kol. 2:11-13, Romans 2:28,29, 1 Kor. 7:19. “Think not that I am come to destroy the law, or the prophets: I am not come to destroy, but to fulfill. At Revelation 2 Yahusha warned the first assembly that He would remove their menorah if they did not repent and do the "first works." Repenting and obeying the Torah, many of us have received the symbol of the menorah, restored to us by Yahusha. The menorah is the symbol of Yahusha, the Giver of the Torah, the Word made flesh. He is the "living Word," the Torah (teaching) as our living example. The parables all point to one thing: the restoration of men to the Covenant relationship with Yahuah. Repent, and He will enable you to obey His Ten Commandments. He will write them on your heart, and you will love Torah. "If you love Me, guard My Commandments." "Repent, for the reign of Yahuah draws near." The Ten Commandments will be around for all eternity, and apply to every mortal being. The instructions on love also apply to every "immortal being" that has ever been created by Yahuah. The adversary seems to have a problem with obeying them, so it's easy to see why so many of us have been deceived. Deception is the objective of our enemy. Discerning Truth is a matter of how one looks at the Scriptures. It's either with an eye of light or an eye of darkness. Paul has been used to make people stumble, but only those who have an eye of darkness. "Go, for he is a chosen vessel of Mine to bear My Name before nations, sovereigns, and the children of Yisharal." - Acts 9:15 The controversies about Paul and the Torah have been used to separate the sheep and goats. Is it the MORAL law, or the CEREMONIAL law that Yahusha completed for us? The blood of animals was unable to deliver anyone; that was the old, obsolete covenant and the old priesthood. The truthful answer to this question will go against 1950 years of false interpretations of Paul's writings. The need for animal sacrificing and circumcision of the new adult male converts is fulfilled now in Yahusha's work performed inside us. Some want to hold onto adult male circumcision for converts so much, they refuse to have fellowship with those who understand Paul differently. They may as well sacrifice animals as well, because they don't understand Paul's writings. We are the workmanship of Yahusha, not the works of the hands of men, so our deliverance is not based on anything men can do to correct our flesh, or wear on our heads. Those perishing have not received a love for the Truth (Torah, the Covenant), while those who have received this love for Torah from Yahusha obey the Covenant and have fellowship with Yahuah, and with the brothers. Yahusha’s scars will overwhelm us when we see them. They will be very personal to each of us, showing us the extent to which Yahusha went to deliver us because of His love. Today there are many against Paul, but because Yahusha is for him, I defend him. The Golden Rule is working in the last six Commandment. The 9th teaches us to never carry harmful testimony (gossip) about our neighbor. Even if it’s true, we would not want others speaking evil about us. When we bring damage to others, we will have to answer to Yahusha for it. Paul’s reputation has been greatly harmed. Be careful of those who promote hatred on the Internet. They can poison our hearts with lies and turn us into propagators of their guile and gangrene. Paul is being attacked because the veil is being lifted on his words, and many people are finally understanding them. This understanding is uniting us, and the adversary is doing everything possible to quell this working of Yahusha's Spirit. as Paul his reputation among the Natsarim was almost as bad as the name "Hitler" is today. He was a severe persecutor of the Natsarim. A change in name could also have served another purpose. Since he was not known by sight to many of the Natsarim, it could be that many of those he had formerly worked for did not know him by sight either. We also know they were seeking him to kill him. From this point on in Acts, Shaul seems is referred to as Paul. In all of Paul's letters, his name appears as Paul, and never as Shaul. For my own understanding of this change, the former name Shaul went out of use after his conversion, and he has been called Paul ever since. If Catholicism / Christianity is a hybrid mixture of Paganism and the Natsari faith, don't blame Paul - look at Marcion, Cyprian, Augustine, Origen, Eusebius, Ossius, and Constantine. Paul literally suffered for the Name of Yahusha: he was stoned and assumed dead. This may have been the source of Paul's thorn since being stoned can leave you in quite a damaged state. Some believe it was bad eyesight. Go easy on him; have a heart. Much more about Paul is found in the article on circumcision. The book of Galatians seems to be widely misunderstood by those in "dispensation" theology (a heresy), as well as "replacement theology" (another heresy). Men keep repeating the idea that because Luke is a name derived from the Greek loukas (light, bright, warm, etc. ), the writer was himself a convert. We should be lukewarm about listening to men’s ideas, and remember that Yahuah is listening and examining our thoughts toward one another. Yahuah doesn’t look upon the outward appearance, but upon the heart (thoughts, mind, character, motives). One day, we may learn that Luke was a kohen. YashaYahu 56 shows that foreigners will be given a name BETTER than sons and daughters, all who guard His Shabath, so our parents, skin color, chicken-twirling, rosaries, merit badges, Sunday service attendance, and steeple-building will not help us look better to anyone, except other deluded humans. Luke is a servant of Yahusha, and this is why he and Paul were created. Let's all quit looking at each other, and learn that Yahuah created us to serve Him, and stop condemning each other as they struggle to serve Him.